Are you ready for Bonanza slot big time gaming? Head to the mines of this 6 reel video slot machine located amongst beautiful scenery. As you spin the reels that offer you 117,649 ways to win, you’ll find an array of surprises in store! Start your adventure in the best way by learning more about how to play this thrilling marvel! How to play Bonanza Slot? Ready to set the reels to spin for great chances of winning big? The reels of Bonanza Megaways Slot are adorned with some stunning symbols. You will find gobs of gemstones like the sapphire, emerald, diamond and ruby. If you are wondering what the highest paying symbol is…drum roll, please…. It’s the diamond and it will award you with 50 times your bet amount if you have 6 of these symbols in a row. There are some other extra special symbols like dynamite and a combo of 4 gold bar with letters G, O, L and D.
Keep an eye on a cart carrying gold bars, it is, in fact, a special bonus symbol. 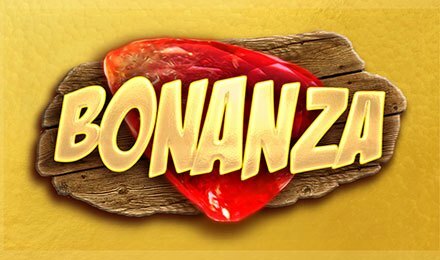 Play bonanza slot on your favourite devices. Bet Level: There are no Bet levels on Bonanza Megaways Slot. Coin Values: There are no coin values. You can choose your stakes from the following: £0.20, £0.40, £0.60, £0.80, £1.00, £2.00, £4.00, £5.00, £10.00 and £20.00. AutoPlay: Do you want to sit back and enjoy the experience? Here’s how! You can use the AutoPlay feature to select a certain number of spins that will automatically spin on their own. Wild: The wild symbol is represented by stacks of dynamite that are set on fire. They can substitute all the symbols on the Bonanza Megaways Slot except the scatter symbols. Scatter: Do you have any guess of what the scatter symbol could be? It is a combination of four gold bars that all together form the word GOLD. The scatter symbol will award you with a total of 12 Free Spins. When the feature is launched, every single gold bar that comes into view will grant you with 5 free spins. Free Spins: While using the Free Spins Feature you will find the exploding reels. A multiplier also applies to any of the payouts after a successive explosion. It all starts at a 1x multiplier and then increases by 1 during each subsequent explosion win. Watch out for bars of gold. They will come into view in the carts above the reels when the feature is launched. If you get three of these symbols, you will be given another 5 Free Spins to your tally. Get four and you will be awarded another 10 Free Spins. Bonanza Megaways Slot is optimised to work seamlessly on your smartphone. Have you already created an account? Join Irish Spins and as soon as you make your first deposit, the amount will triple. Amazing, right? You will get a 200% Bonus + 50 Free Spins on Starburst. On your second deposit, you can enjoy 100% Bonus up to £250. Finally, on your third deposit, you can revel in 50% Bonus up to £500. After reading the Bonanza Slot review, you are good to go to spin the reels of this fun and fabulous slot machine. Good luck and get some huge wins!